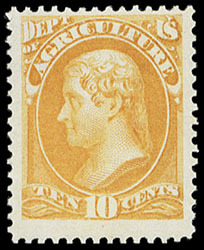 Agriculture Dept., 1873, 10¢ yellow, o.g., never hinged, rich brilliant color, wide margins, F.-V.F. ; with 2012 P.S.E. certificate. 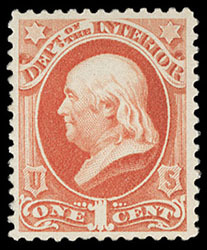 Interior Dept., 1879, 1¢ vermilion, o.g., never hinged, strong bright color, attractive centering and margins, Very Fine; with 2002 P.S.E. certificate.